This week I am posting a heart wrenching story that is emotionally powerful and brought the tears flowing. It gives me pause and makes me wonder about the power of music and how much the fans around the world appreciate the Gibb brothers and the beauty of their work. I am very grateful that fans feel comfortable enough to write to me about their innermost feelings and hope you all will enjoy this special message. It comes from a psychiatric nurse at Johns Hopkins Hospital who has been working with patients for 26 years. I first encountered the Bee Gees when Main Course came out. I was about 10 years old. At the time, I was a depressed child, bullied at school, having moved from South Jersey to Maryland with a funky accent and quirky mannerisms. Life seemed to get worse for me; what 10 year-old thinks of dying every day, but I was there. EXCEPT when I got the Main Course album and listened to it endlessly. It took me away to comfortable place, a place where I could be myself and no one was there to judge me. Things did get worse; by the time I was 12 I took my first overdose. I spent 7 months in a mental hospital, as Spirits Having Flown gave me a will to live. I remember the 1979 concert at the Capital Center in Washington, D.C. My sister bought me tickets, but my doctors did not recommend me going, forbidding my discharge until after the concert. Luckily, the insurance ran out, and i was able to go, and my very real encounter with my idols was the highlight of my life. I tried my best to go on, attending high school against the advice of the school board who wanted me to go to a school for the emotionally disturbed. I refused. I relied on the Bee Gee’s music every day to sustain me as I really didn’t have any other coping mechanisms, and it worked! I was integrating back into normal life the best I could, but with their help, which was better than any therapy I got. Things went well for a year or two, and then I was raped when I was in the 10th grade. I lost my bearings, and spent more time in the hospital. This time was a little different, however, as I don’t think I really wanted to die, but I just needed more help. Again, the music carried me through and I credit it as my inspiration. You see, I had to make a decision. What am I going to do with my life? Am I going to live, or am I going to live my life in and out of hospitals? I really thought that Barry, Robin and Maurice would want me to buck up and go on, and that’s what I did. I graduated high school with honors, then went to nursing school at the University of Maryland and graduated with honors, with my Bee Gees at my side. I was fortunate enough to see them in 1989 at Merriweather Post Pavilion in Columbia, Maryland. I was a brand new nurse and credit it all to them. Today when anyone asks me how I succeeded, I thank those three wonderful human beings who, through their wonderful music, gave me a reason to live. I have made it through the deaths of Mo and Robin, my “brothers” and praise Barry to the ends of the earth for the life I now have. I’m married and have a beautiful 10-year-old daughter. I have a career that I could really only dream about, and I have an endless love in my heart for those three brothers from the Isle of Man who have saved my life on many occasions and have brought me endless joy. I just want Barry to keep singing all over the country….I think he should just sing in every state of the union. How cool would that be? I hope Barry might read this. They saved the life of this lovely woman. AVW, you are loved. I have had my share of issues and still do. But you inspire me to be strong & use the gift of Mo, Barry & Robin to overcome! Thanks so much for the comment. I send all posts to Barry, so I am sure he gets them and hope they will inspire him to keep performing for the fans. This beautiful letter has me crying…it could have actually been written by ME. I was also about 10 when Main Course came out (so we’re the same age), and I let their music into my heart at a time when I would have otherwise retreated into a very dark, inner world. I was being sexually abused by a family member, yet was never able to tell anyone because I knew how hurt my loved ones would be. Losing myself in the gorgeous melodies is what kept me from complete despondency through those 4 years, and “my” brothers have continued to give me strength. Currently, my husband has end-stage terminal throat cancer. I saw Barry perform at Hollywood Bowl on June 4 (a magical night! ), and then… my life-long dream came true: I got to meet Barry!! I hugged him, kissed his cheek, and was so overcome with emotion just blurted “I’m in love with you!” I felt like such an idiot, but I didn’t know how else to sum up everything that he’s meant to me over the years. So Barry, if you ever read this, just know that Christy from Santa Barbara just wanted to express how grateful I am for all of the support he continues to provide for me even now, during the very most difficult time in my life. Thank you. OH, Christy, I am so sorry about your husband, and I pray for both of you.I will get my rosary working. Although you have a rough road ahead, it was wonderful to hear that you did see Barry and have your moment with him. That is fabulous. 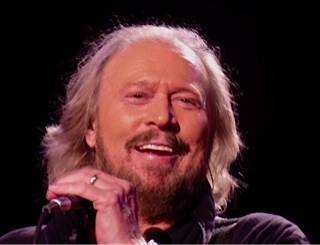 Thank you for taking the time to express your feelings and for reading the stories from your fellow Bee Gee lovers. OH, Carolyn, I love what I do! The fans are wonderful and Barry is a gift…. Thank you! Play the music forever and smile; it will always help whatever is happening in life. Simply, this is GREAT !!! This is our boys !!!! I agree…it is GREAT! I was so moved by this and so happy to post it. Yes, amazing and heartfelt…makes me so happy to post this type of sentiment. I know how you feel. We need to hold on to the wonderful music. It helps when we get sad.